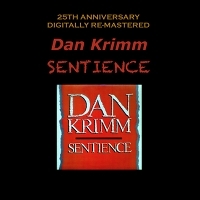 The digital release of 'Sentience' in 2011 on Another Pass Productions follows twenty-five years after the initial release in 1986 on vinyl. This disc was derived from a high-resolution (24/96) digital transfer from the original analog master tape (stereo mix) and re-mastered for CD and digital download. Some modest improvements in equalization and gain levels were made in the re-mastering process, producing a superior sound quality compared to the original vinyl LP. The re-release program reverts to the track order as originally recorded for demonstration purposes in 1985, except that it excludes Dolphin Dance in order to publish only original compositions for on-demand distribution. Longer timings reflect a more relaxed "fade-out" from the original analog mix (truncated slightly for vinyl because of total program time limits, which also influenced the equalization, compression and gain for the vinyl version, in order to fit into the alloted time even with a relatively tight groove spacing). Ever since Jaco Pastorius burst onto the scene in 1976, electric bass players have been stretching their own limitations, exploring the potentials of their instrument. No longer content to just keep time and hold down the bottom, they began experimenting with harmonics, chording and a kind of nimble-fingered soloing style that had previously been associated with guitarists, not bassists. Jaco definitely turned things around for bass players, and countless hundreds followed his example. Among them was a classically-trained violinist from Ann Arbor, Michigan, who was majoring in Philosophy of Science at Princeton University. Inspired by Jaco's bass playing and by the refreshing group sound of Light As A Feather-era Return to Forever, Dan Krimm put his violin on the shelf and picked up the electric bass. Now, nearly ten years later, Krimm bursts onto the scene himself with this impressive debut album. Funded in part by a grant from the National Endowment for the Arts, SENTIENCE is a showcase of Krimm's considerable skills as both a bassist and composer. The seven original compositions here represent different periods in Krimm's growth from 1978 to 1981, and his accomplished playing on them is enough to make even Jaco sit up and take notice. Basically self-taught on bass, Dan met and began playing duets with pianist Gary Monheit when the two attended Princeton together. During their tenure there they also performed in a band called Mainstream, which featured guitarist extraordinaire Stanley Jordan, a fellow Princeton alumnus. Dan moved to New York in 1981 and began gigging around town in duo and trio situations. His work with Gary on SENTIENCE highlights the close musical rapport the two have had since their Princeton days. For SENTIENCE, Krimm assembled a stellar cast of musicians. Saxophonist Marty Fogel, an ECM recording artist with the Everyman Band, lends his distinctive tenor sound to the swinging "Mordor," named after the land where dwells dark lord Sauron (of Lord of the Rings). He overdubs tight soprano and tenor harmony lines on the funky "Rumpus" and stretches out with a highly expressive soprano solo on the hauntingly beautiful "Spirit Dance." Guitarist Vic Juris, a Muse recording artist who has toured extensively with Barry Miles, Larry Coryell and Birellie Lagrene, is featured on the classic Herbie Hancock composition "Dolphin Dance." He also lends some fleet-fingered solos to "Golden Bisque" and "Wheat Fields." Drummer Grant Jarrett, who plays on George Young's new album Chant, and whose brother Keith is the renowned pianist, hooked up with Krimm after answering an ad in the Village Voice. Check out his subtle brushwork on "Dolphin Dance," his insistent backbeat on "Rumpus," his relentless swing and disciplined stop-time playing on "Mordor." Flutist Jan Leder adds a gentle touch on the etherial "Partly Cloudy on the Sheep Hills" and flutist Herb Kloss blows with fervor on "The Rise and Fall." Compositionally, the influences on SENTIENCE are apparent. Jaco, Pat Metheny, Herbie Hancock and Return to Forever figure prominently, yet Krimm is able to assimilate those influences and produce a sound that is uniquely his own. From the fusion of "Golden Bisque" to the jazzy cha-cha of "Mordor" to the swinging funk of "Rumpus," Krimm keeps things fresh and flowing. Check out the clever middle section of "Rumpus," the darkly-colored soundscape of "Spirit Dance," the tricky 7/8 over 7/4 meter of "Wheat Fields." This is a talented composer in full flight. 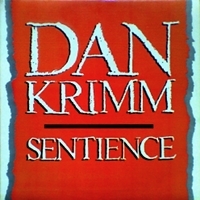 And as a player, Dan Krimm makes strong statements throughout SENTIENCE. His extended intro to "Partly Cloudy" is a virtual clinic on the art of playing harmonics. His sonorous solo on that one recalls the melodious bass playing of Steve Swallow while his nimble funk lines on "Golden Bisque" and "Rumpus" bear the unmistakable stamp of Jaco. Check out Dan's swing factor on "Mordor," his melodic lines on "Dolphin Dance" and his evocative playing on the modal "Spirit Dance." This is a gifted bassist who bears watching. SENTIENCE, his auspicious debut album, is only a beginning. You're gonna hear from Dan Krimm. STROUDSBURG - Sentience, a just-released album by a New York bassist and composer, Dan Krimm, has a lot more going for it than most other new offerings you'll find these days in the jazz bins under "Debut Album/No-Name Label." Apart from music that pleases the ear while soothing the soul, Sentience, on the Overtone Label, is underpinned by a drummer with longstanding area ties and a brother whose name you'd recognize. Krimm's recorded debut -- which features former area drummer Grant Jarrett, the talented brother of Keith -- is, as the title suggests, no knock-your-socks-off jam. Nor is it a tinsel-y product of some mostly unheard-of up-and-comers out to hit the jackpot, any more than the first album by the Pat Metheny Group was (the white album, that is, titled the Pat Metheny Group). With a Metheny influence that is prominent but not plagiarized, Sentience is an accomplished and sensual pastiche of eight refreshingly original tunes, seven of them penned by Krimm. 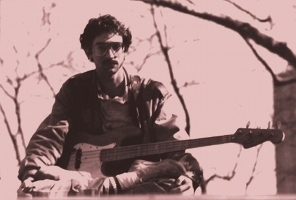 He is identified on the liner notes (by Down Beat magazine's Bill Milkowski) as a former classical violinist whose defection to the electric bass was largely a result of Krimm's having heard Jaco Pastorius. Sentience also features the amazing guitarist Vic Juris on the album's best two cuts, Krimm's "Wheat Fields," and Herbie Hancock's "Dolphin Dance." Juris, whose name will also be recognized locally as the unmistakable melodic force in local drummer Bill Goodwin's trio, Solar Energy, has also joined up of late for some outer-limits' guitar stylizing with the perhaps better-known but no more gutsy guitarist Larry Coryell. Pianist Gary Monheit rounds out the core of the Krimm ensemble, which elsewhere on the album is complemented by flautists Herb Kloss (on "The Rise and Fall"), and Jan Leder (on "Partly Cloudy on the Sheep Hills"); and saxophonist Marty Fogel, who records on the ECM label with The Everyman Band. Fogel plays a spirited tenor or soprano, or both, on "Spirit Dance," "Mordor" and "Rumpus." My favorite, "Wheat Fields," calls to mind Metheny mainstays like "Phase Dance," or "San Lorenzo" for its seductive, etherial harmonics, by Juris and Monheit, over a sturdy Krimm bass line and some tryingly complex rhythms executed by Jarrett not only without flaw but with feeling. Juris' licks here, as always, are streamers of sunlight bounced off a mirror. They throw off a shine that simultaneously bedazzles listeners while blazing a path for fellow musicians capable of following his no-novices-need-apply lead -- which is happily the case in this case. Where "Wheat Fields" exemplifies the introspective though uplifting side of Krimm's skilled writing (and the album itself), "Rumpus" is straight-ahead funk that attests to its diversity. From start to finish, Krimm and Jarrett plant bumps all over Monheit's ice-glazed landscape, while Fogel skates blithely across it all, stopping long enough to melt its core with some steam from his soprano. Hancock's "Dolphin Dance" is the perfect stock for a tangy soup that again features Juris, who here does something very tricky very skillfully -- that is, he seems to be holding back when he's in fact going full-speed ahead. This tune also serves to showcase Krimm's best bass work, and the abilities of Monheit and Jarrett to supply the most sensuous kinds of feathery touches. Krimm parts ways here with Jaco long enough for an interlude that sounds instead every bit like (and every bit as good as) the late Bill Evans' sideman Scott LaFaro did -- and surely would have, had LaFaro lived long enough to complement his own brimming electricity with that from external sources. Krimm's crystalline bass work when he is back in his Jaco mode is the primary feature, too, of "Partly Cloudy," "Spirit Dance," "Golden Bisque" and "Mordor." The three horn players on Sentience perform creditably throughout, but my preference is to hear more of Juris, who rounds out the Krimm ensemble most fittingly. The quartet that features the Juris flavoring, that is, gives Krimm's writing its most distinctive voice, the voice it most deserves. That is a middling complaint, however, about a debut album whose compositional excellence rivals the Metheny group debut, and proves again a theory I've held a long time -- that the no-name label bin on any day contains at least one pearl.